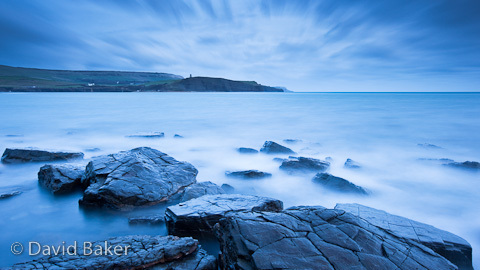 I thought I’d carry on from the previous blue toned Kimmeridge shot. This one was taken on a cold December evening and is shot across the bay towards Clavell’s Tower, believe it or not the ledges that I posted earlier extend beyond this point. The tower in the distance is Clavell’s Tower and was built in 1830 by Reverend John Richards Clavell of Smedmore as an observatory and folly. For many years the tower stood derelict and due to coastal erosion came close to falling in to the sea, at the cost of £898,000 it was dismantled and re-erected 25 meters back from the cliff face. ~ by David Baker on 12 March, 2010.